None of those renderings are even close to being accurate if this will be 550ft. Either the height is wrong or those renderings are extremely exaggerated. I keep forgetting about this tower. When someone responds and brings it back up to the top I have the pleasure of puking in my mouth a little bit. First time seeing this so pardon my shock. What the Hell!!! NY seriously needs to just shutter all development near 5th ave until after the recession. Right now developers are just rushing to offload their assets and could care less about aesthetics. This design is unbelievably bad and I hope too god NY stops it. They are literally building a trash tower next to the building that brings in billions of dollars worth of tourism and is a global landmark. Bjarke is no longer an architect in my eyes, he’s just another run of the mill developer. This is just absurd. This is the worst building going up in NY. Humanity built Chrysler and the Taj Mahal, and this is what we’re doing in the 21st century in the world’s richest nation? So 53W53 got a height chop, but this is allowed to grow in front of one of the most famous buildings on the entire planet? New York better wise up quickly. Unfortunately I’m not surprised this POS is rising right where it is…same reason ESB was called empty state building for a time: Its just not a premier location. Developers have been putting up trash in the area for 10 years. Tourists make the area crowded and tacky. Same issue became a big problem for 4 times square after conde nast left if I recall. Also a reason why Morgan Stanley wants to leave Times Sq. What I don’t get is: The developer HFZ gave BIG creative freedom for 76 11th ave: Why call for lowest common denominator from a big name architect? It even looks like they moved the core to the exterior…not a good look. They couldve paid costas kondylis to dig deep into his bag of tricks for the same thing. Anyone else think this site is huge for a building of only 300k sf? Whats the FAR? This is my first time seeing this. The Home Insurance Building looks nicer than this. And that’s me being nice. A total abomination. And some people complain about Foster, smh. Sorry to bump this one again. Not trying to make you sick again. Lol. Looks like more test drilling/soil testing today. Plus a unique view of the ESB that will be gone. 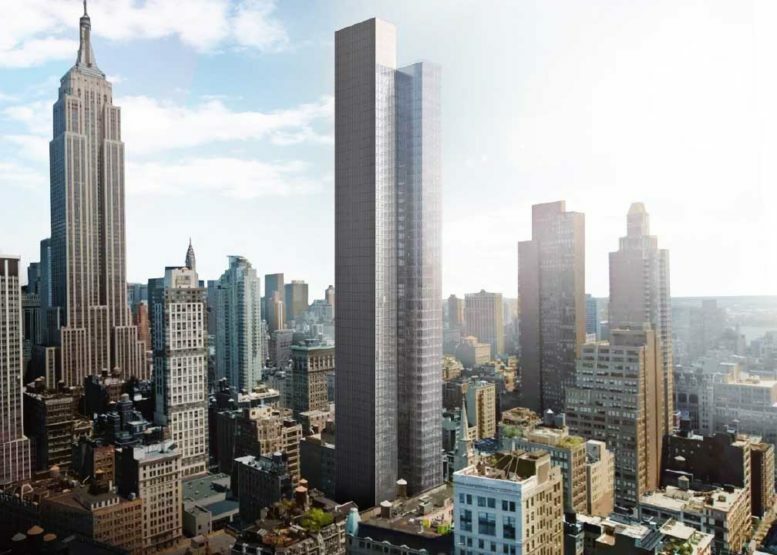 While I loathe the prospect of this heinous PoS rising near the ESB, at least HFZ is eliminating some filthy garbage. Praying this one will stall like that Russian abomination nearby. I am cautiously optimistic that BIG’s abysmal design will not rise. It’s no longer on BIG’s website (as far as I can tell), and HFZ’s website no longer references Bjarke. its still on HFZ’s sadly. I knew that the images were, but it makes no reference to BIG. Also, Safdie’s version is also shown on HFZ’s website. More importantly, this horrific project is no longer in BIG’s website.